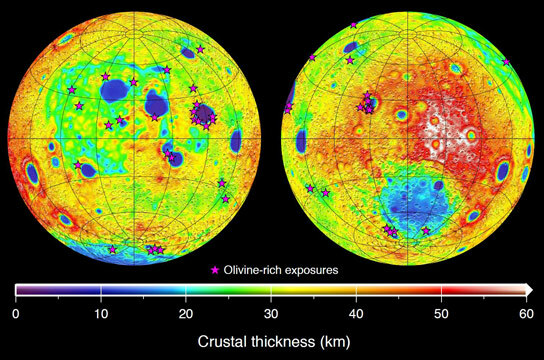 GRAIL Mission Provides New Insight into How the Moon Got Its "Face"
JPL, a division of the California Institute of Technology in Pasadena, California managed GRAIL for NASA’s Science Mission Directorate in Washington. The mission was part of the Discovery Program managed at NASA’s Marshall Space Flight Center in Huntsville, Alabama. NASA’s Goddard Space Flight Center, in Greenbelt, Maryland, manages the Lunar Reconnaissance Orbiter. Operations of the spacecraft’s laser altimeter, which provided supporting data used in this investigation, is led by the Massachusetts Institute of Technology in Cambridge. Lockheed Martin Space Systems in Denver built GRAIL. Be the first to comment on "GRAIL Mission Provides New Insight into How the Moon Got Its “Face”"